Got good seats to the ballgame? Visually show guests where they’ll sit. If you’re selling great tickets to a desirable concert or sporting event, what is one of the key pieces of information a bidder would want to know? The location of the seats. Given that most of your bidders are visually-oriented, you’ll want to include a diagram indicating where those seats are, in relation to the action. Though you can and should tell bidders that the tickets are in Section 120, row J, seats 1-4, it’s just as important to show them that location. 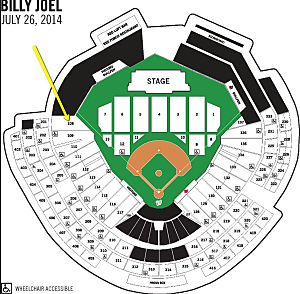 If you’ve got great concert tickets, point them out, as I did for Billy Joel. Your silent auction display should include a visual diagram. If you search for it, you’ll find that major venues have schematics of their properties online. 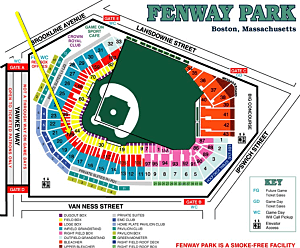 tickets to a Red Sox game at Fenway Park in Boston. tickets to a Billy Joel concert, which was held at Nationals Stadium in D.C.
Actual views from the seats are also nice touches. A handy tool is the website A View From My Seat. You can use http://AViewFromMySeat.com to find an actual photo sharing the view of the activity (concert, game, lecture, etc.). Do you see the photo of the ballgame? 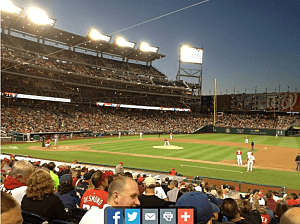 I pulled that photo from this site to help show bidders what the ballgame would look like from their vantage point. In short, visuals speak volumes, so add these types of visuals to your arsenal of silent auction display ideas.